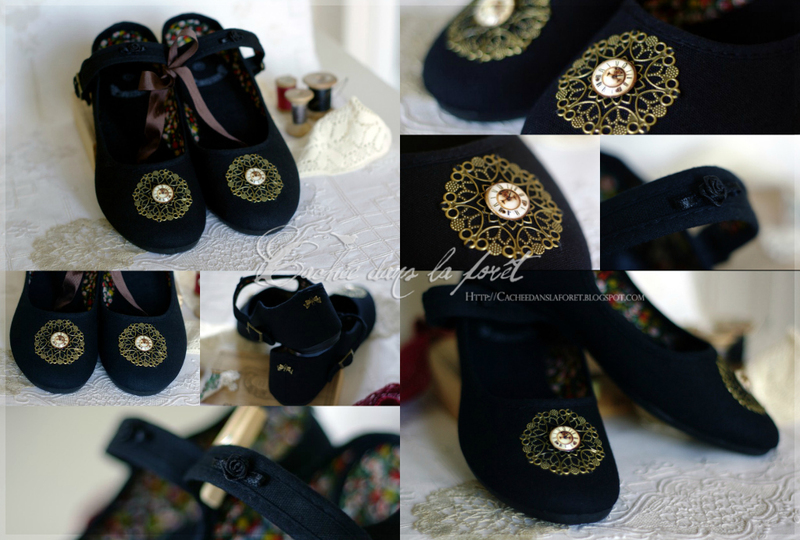 Cachée dans la forêt shoes #2: "The Time Traveller's Wife"
This is the second pair of limited collection of One Of A Kind shoes by Cachée dans la forêt. 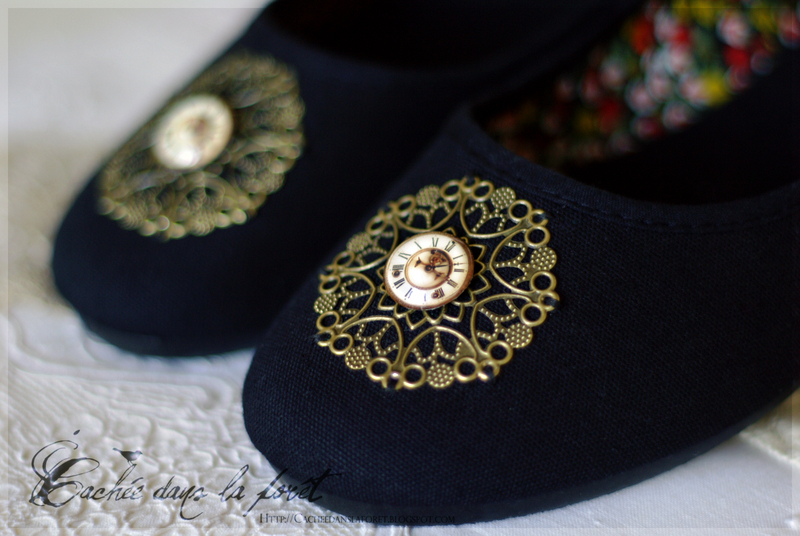 I really enjoyed making the prototype pair you could see on a teaser photo some time ago, and I have decided to continue the project. 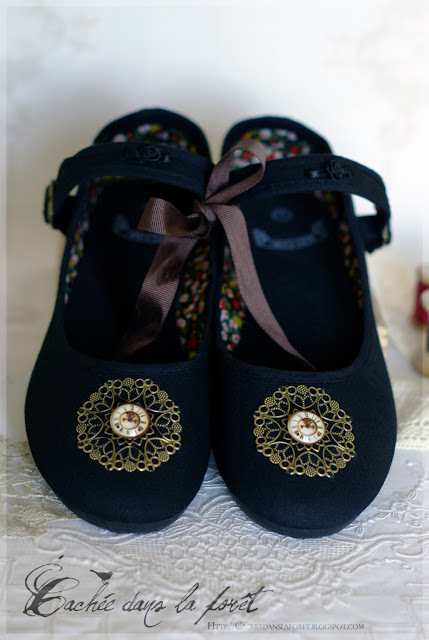 Of course it's also possible to commission the shoes in your size with your own design - I love making bespoke pieces for you! Those gorgeous Mary Janes are adorned with filigree brass rosettes with images of ancient clocks hidden under magnifying glass domes, ribbon bows and roses, and brass bows on the heel parts, those shoes are romantic but with a bit of a twist. Perfect for time travellers, sentimental souls or steampunk adventurers! 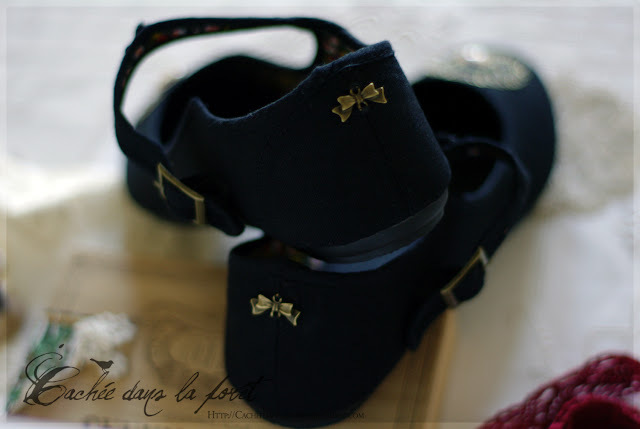 Suitable for everyday wear & certain to suit a wide range of outfits, the canvas shoes feature a buckled strap to the top of the foot ensuring a secure fit, and a gorgeous floral patterned inner. 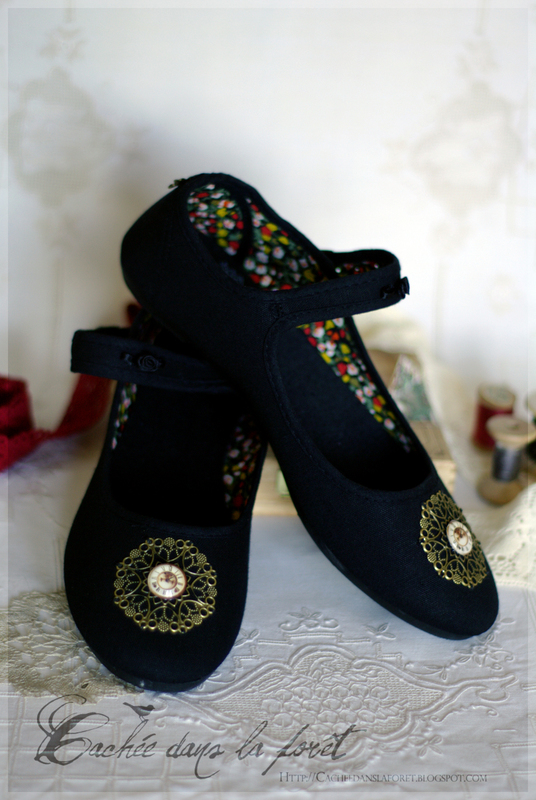 Textile upper and inner, synthetic sole. They are really comfortable - I have been wearing the prototype pair #1 for a long time now and I have to say the quality of the shoes is superb! The pair is size 7 UK / 40 EU. 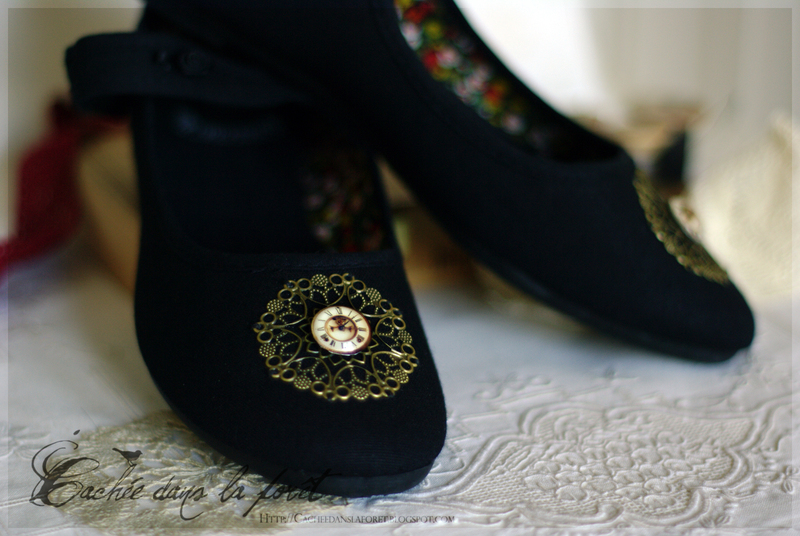 They are available for purchase in my etsy shop. Hello there! 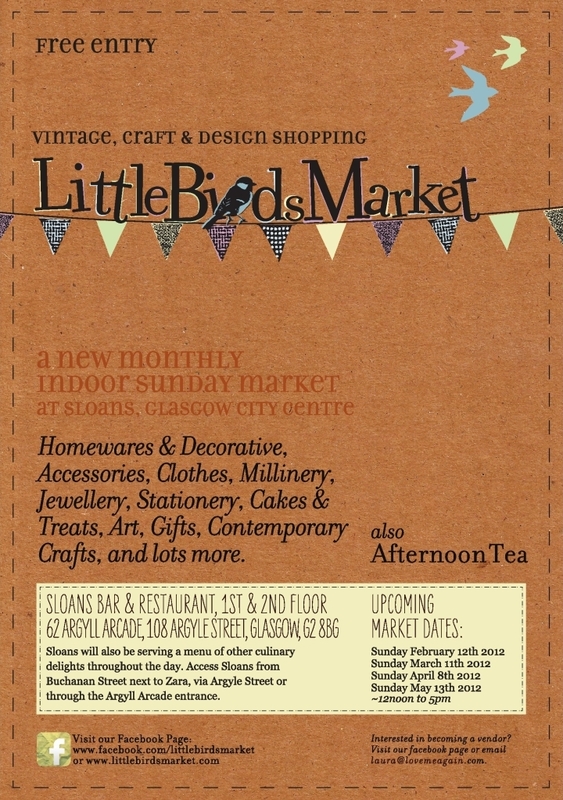 Just a wee reminder that Cachée dans la forêt will be on Little Birds Market tomorrow, at Sloans, 108 Argyle Street (indoors!) 12 to 5pm. 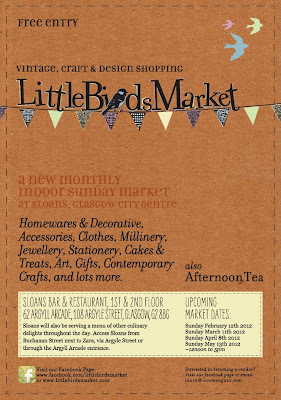 The Little Birds Market returns for March with a gorgeous line up of vintage, craft & design sellers setting up shop in the glorious surroundings of Sloans Glasgow. With Mother's Day fast approaching, March stallholders have been working away on new creations and will have a host of great gift ideas on offer to delight your mum with ....or yourself! Entry is free. Come and see us on Sunday March 11th - 12noon to 5pm - remember we are inside Sloans on the 1st floor and 2nd floor ballroom. We are giving away prize gift vouchers to spend on the day of the market - pop into the market and see if you are picked, on the spot, as a winner. 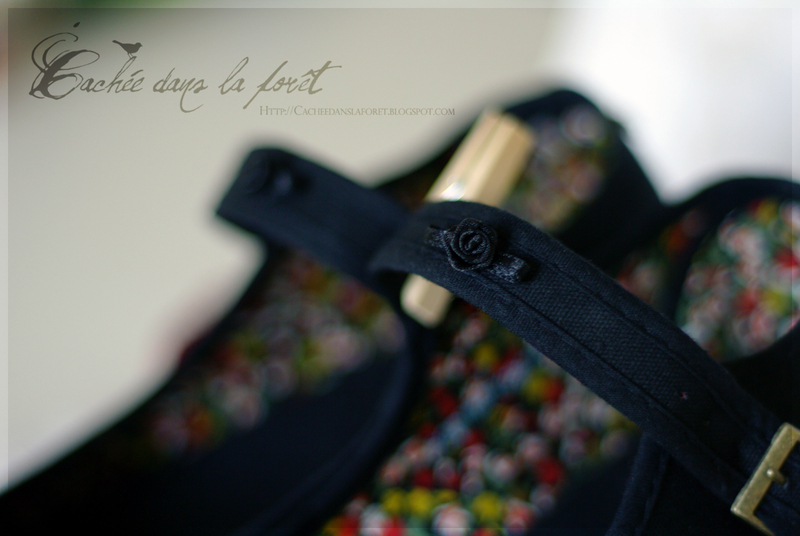 Cachée dans la forêt shoes! 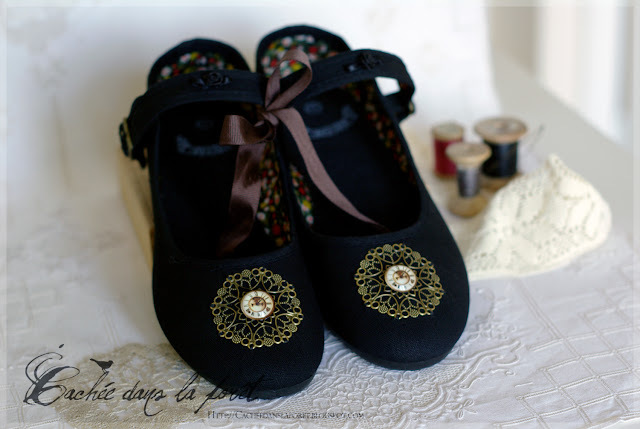 Here's a new idea: how about Cachée dans la forêt shoes? 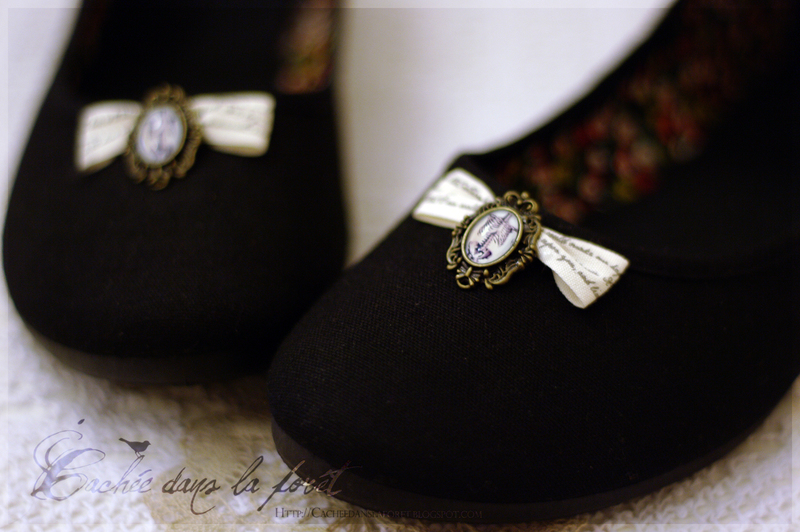 Comfy black mary-janes, adorned with retro-style ribbons and old photographs, each pair one of a kind. Would you like to see them available for purchase? Cause making them is a lot of fun.